The Saints board are set to consult current and former players as they seek to recruit the perfect successor for Jim Mallinder. Mallinder's 10-year stay at Franklin's Gardens came to an end on Tuesday as the club opted to part company with the director of rugby. They are now in the process of bringing in short-term coaching support and a long-term boss. And the board will get advice from as many trusted sources as possible in their bid to replace Mallinder successfully. "We're incredibly lucky here because that Saints family is widespread and highly capable," said chief executive Mark Darbon. "We'd be mad not to talk to, in one form or another, some of our trusted advisers, in the same way we'd be mad not to get input from our senior players here. "We're blessed with a lot of experience and capability in our squad, but the decision will ultimately be made by the board." 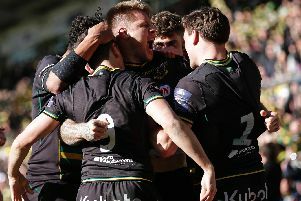 Mallinder enjoyed a largely successful stay at Saints, winning the Aviva Premiership in 2014 as well as two Challenge Cups and an Anglo-Welsh Cup. He steered the club to promotion back to England's top tier in 2008, a year after taking over, and also led them to a Heineken Cup final, in 2011. And Darbon knows just how big a task it will be to replace the 51-year-old, who had a contract until the summer of 2019. "There are a lot of things that will play into this decision and whoever takes over has got big shoes to fill because Jim's overseen an incredible period of success for the club," Darbon said. "There are many factors we'll be considering and ultimately it's about having someone who can thrive in the environment here and who can bring the level of success we're looking for."